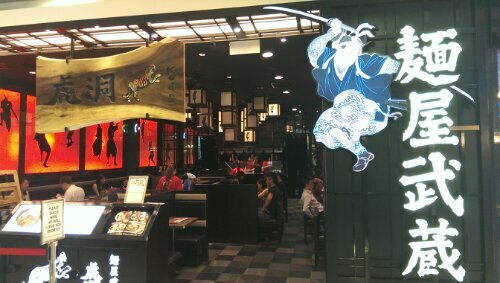 Menya Musashi Kodou @ION Orchard (Singapore) | Get Your Grub On! Since my head and heart were still in Japan today I felt like ramen all over again. My friend suggested ‘Menya Musashi’ at ION and as I had the privilege to eat at their flagship store at Shinjuku recently I was pretty curious how that translated here in Singapore. When we arrived I recognized the famous sword fighter at the entrance from the noren hanging over their door in Japan and felt considerably excited. 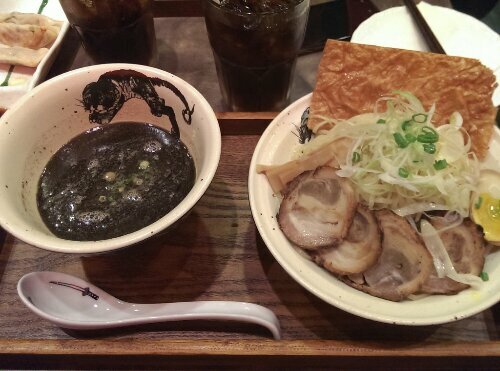 Even that they had a ‘Black Thunder‘ spicy version on as a special I maneuvered my way around it and ordered their ‘Black Tsukemen‘ instead as dipping is just more fun. While ordering I realized that this is tonkotsu ramen other than the salty shoyu version I had in Tokyo but didn’t mind as tonkotsu is one of my favorites. Also here they offer different sized portions of noodles of up to six times the regular size without any surcharge when ordering. Double should do. When it arrived it expectedly looked fairly different to the Shinjuku bowl. Here they are using Chashu instead of braised pork belly which didn’t look very appealing but didn’t taste too bad nor too good. Another add on in Singapore was the crispy beancurd skin which was a nice texture in between but tasted too sweet for me. Under the little mountain of chopped green onions to my surprise I found that the noodles weren’t much different to the ones I fell in love with in Japan, yellow, thick and twisted and nicely chewy. I started dipping and slurpring them through the bowl of tonkotsu broth with the black garlic oil. The taste was pretty okay and I liked especially the porky and strong garlicky flavors but what put me off a bit was the looks and consistency. It literally looked like thick dirty mud water and was a bit slimy which wasn’t too nice while eating so I decided to refrain from finishing the soup after my noodles were gone. This was more a completely new experience rather than a comparison between one brand in two countries and obviously I would always opt for the original one if I could but besides the consistency of the broth and the rather sad chashu the taste was overall not bad. I might come to try this spicy version but for my regular ramen fix I’ll probably go looking for new ventures.